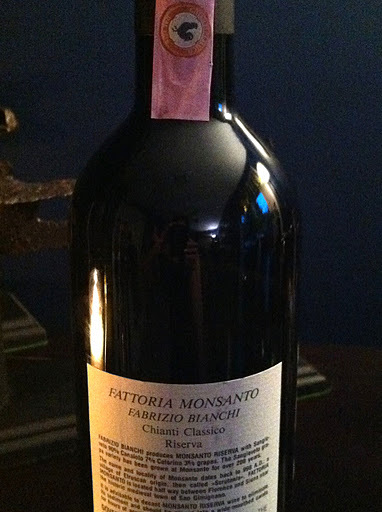 A couple of years ago I was mad for Monsanto Riserva Chianti. It was big and bold, traditionally gorgeously Tuscan, and one of the best Chiantis I’ve ever had. Quite a few bottles found their way into my home, however, this was before I had discovered the merits of willpower and cellaring. After awhile, the 2003 disappeared from the wine shops shelves. I chided my shortsightedness and patiently waited for the next vintage to arrive. Admittedly when it did, it took me awhile to pick it up, as I haven’t been too inspired with most Chianti lately. 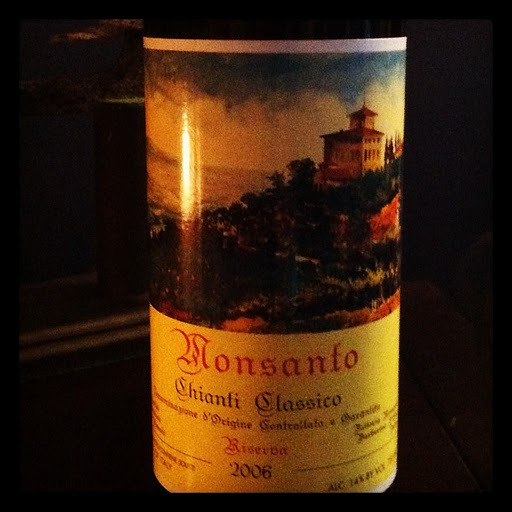 So when I opened the Monsanto Riserva Chianti Classico 2006, I had high expectations. The fantastic label lore such as the black rooster [gallo nero]on the DOCG label, Riserva and Estate Bottled all heightened my excitement. I used to let the 03 decant for about 2 hours, the back label on the 06 forewarned me to “decant Monsanto Riserva wine to eliminate its sediment and should be placed into a wide-mouthed carafe for hours of aeration time.” I decanted for about 3 hours. There were wafts of light floral aromas, but the smell of alcohol presided. The medium body delivered tart cherry flavours and damp earth notes. The lengthy finish displayed notes of black pepper and toast. The density, bright acidity, huge tannins all lead me to believe that this will be amazing in a few years. A brief investigation led me to The Wine Advocate which reports that its anticipated maturity is 2012-2026. Once again I had caved to “bottle-pressure” and cracked into a bottle way too early. I promise to cellar the next Monsanto Riserva.